First thought: As a person whose first foray into genealogy was at 12, serious entry at 18 and who conducts a class in it for 14 year olds every year, I'm always interested in what attracts kids about their family histories and what puts them off. My experience is that many kids are curious about the past of their family, love talking to older people about family stories and take great pride in presenting their findings. However, even with the most basic research they struggle with referencing, let alone the minefield presented by the vast array of sources used in genealogy. Second thought: I have been very fortunate to undertake extensive university study. I'm currently beginning a PhD in a field which uses Turabian's style guide. I have an Honours degree in a field which uses MLA and have also undertaken study which required Chicago. I have invested weeks of my life into correctly creating and formatting citations. It's tedious. It's dry. It's far and away my least preferred part of study. Whenever I whip out my copy of "Evidence Explained" to work out how to reference a particularly atypical source, I'm reminded of the advice one of the head librarians at Adelaide Uni gave us after a four hour session on referencing: "Ultimately, it doesn't matter what system you use as long as it can be used to locate your original sources and is applied consistently". I really appreciate the work that's gone into "Evidence Explained" and apply it as fully as time permits, but ultimately when I read someone's family history I just want to be able to work out what their original sources were, and preferably without too much confusion. James Tanner is dead right. Nobody benefits when we make it seem too hard for the average person to be able to cite sources. 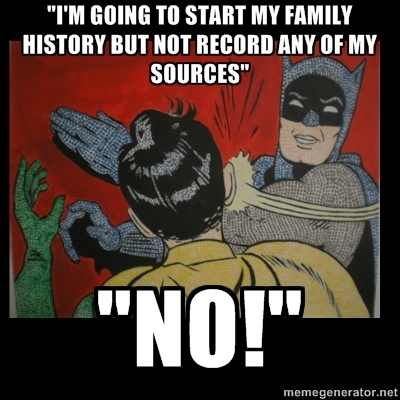 Let's focus first on encouraging everyone to record their sources in whatever format works for them, whether it be the one on their genealogy software, something they've used in study, or something else altogether, especially our new family historians. Spot on. Genealogy is a hobby for me, not an academic pursuit. I cite my sources so that others can find them. That's good enough for me. I'm not lining up to buy Evidence explained.